Uses: Conference Area/Meeting Room, Government, Training Colors: Blue Lengths: 11 panel 20'-5" Heights: 6'-0"
President Harry S. Truman formed the Air Force Reserve in 1948, and since that time, it has been a critical part of the nation’s defense. Its mission is to provide combat-ready forces operating in various locations around the world. The Air Force Reserve performs about 20 percent of the work of the Air Force, including traditional flying missions and other more specialized missions, such as Weather Reconnaissance, Aerial Fire Fighting, and Personnel Recovery. The Air Force Reserve has evolved from a “standby” force for emergencies into an active duty Air Force. Air Force Reserve members serve on a part-time basis and not full-time, and stay in their local communities. Reserve members work or attend college, and are paid for their service.Each Air Force Reserve facility offer various services to the men and women that serve our country. With that in mind, they need a flexible space that adjusts to their various needs. Members of an Air Force Reserve unit meet at reserve facilities for training exercises. 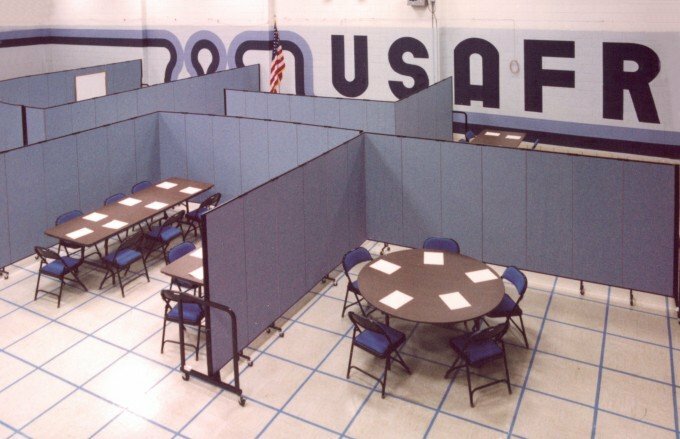 Part of that training takes place in a classroom setting, and because members serve an average of 39 days per year, these classrooms are only needed when they are meeting. When the need for classrooms in the gym is complete, each divider stores in a 2’x3′ space. The gymnasium is now open for physical training.